This pooch is amazing! Like any other dog, Jesse has a huge heart which allows him to offer unconditional companionship and to understand his human friends like no other, a task that is not always easy. However, this dog is special for his great talent and helpfulness around the house! We have already shared a video of him performing house chores, preparing breakfast, taking out the trash, doing the dishes, and picking up the newspaper. 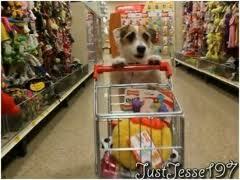 Now, can you imagine Jesse going shopping? Well, the following video in more than eloquent!